When Karl-Anthony Towns tweeted his support for the Eagles over the Vikings, at least he wasn't putting millions of dollars on the line. 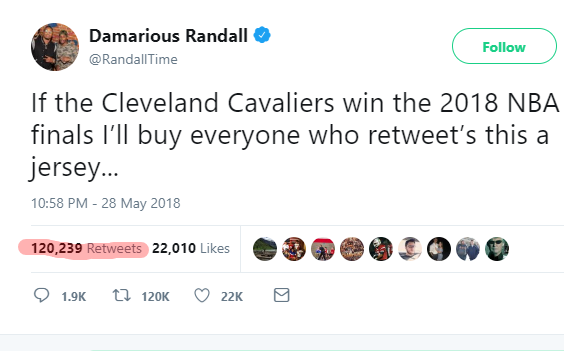 Damarious Randall, the former Packers safety traded to the Browns in March, doesn’t seem to have crunched the numbers or considered the full impact of his statement before launching an ill-fated tweet Monday night after the Warriors defeated the Rockets. Randall is a big Warriors fan, and that victory put them into the finals where they’ll face the Cavaliers for the fourth consecutive year. Now, Randall shouldn’t be expected just to root for the Cavs just because his new team happens to share a city with the franchise. The Wolves’ Karl-Anthony Towns took a lot of grief for rooting for the Eagles over the Vikings, but what’s a guy supposed to do? That said, at least Towns had the good sense not to turn his rooting interest into a full-blown financial risk. So, yeah, he was probably expecting a little action. He probably wasn’t expecting 120,000 retweets (and rising rapidly). Assuming he’s talking about an NFL Browns jersey, those go for $99.99. So as of now, he’s on the hook for $12 million worth of jerseys. (Maybe it’s a fitting punishment for putting an apostrophe in “retweets.” If that’s the only way someone can learn that plural is not the same as possessive, so be it). And if you thought he might notice those numbers climbing and issue a tweet saying he wasn’t serious, Randall doubled down and said he was serious. So Randall is getting hammered by Browns/Cavs fans who don’t like that he’s rooting for the Warriors, plus he’s on record with a claim that — if carried out fully — puts him on the hook to pay out more than he’s made in his NFL career. That said, the Warriors are huge favorites against the Cavaliers. He could place a sizable bet on the Cavs to cover some or all of his potential losses — or he could just trust that Golden State is going to take care of business and earn him some free publicity in the process.